THE AEGEAN SEA is like a large lake, almost completely surrounded by land. Around its western and northern sides stretches the mainland of Europe; to the east is Asia Minor; while to the south, like a breakwater, the long island of Crete separates it from the rest of the Mediterranean Sea. The coasts of the Aegean are deeply in dented with many bays and peninsulas, and scattered across its entire width and length are hundreds of islands. This is a part of the earth that en joys a mild, sunny climate with rainy winters and dry summers. It is here that western civilization began, and the island of Crete, located in the crossroads of Europe and Africa, be came the leader of this early island civilization. By copying their Egyptian neigh bors in the beginning, the early Cre tans progressed gradually, entering the Bronze Age sometime after 3000 B.C. For the next few hundred years, their progress was slow, but by the year 2000 B.C., they had developed a unique and amazing civilization. Near the coasts, for convenient ac cess to the trading ships, thriving industries developed manufacturing pottery and metal works, highly in demand by the trade of that era. Be cause of their mastery of the sea, their nautical skill and daring, the Cretans monopolized the shipping and trading and became wealthy and powerful. Larger cities were formed and, at Knossos, the capital of a kingdom was established-a kingdom that may have included not only the island of Crete, but many of the neighboring islands of the Aegean Sea as well. This kingdom of islands we now call the Minoan empire, a name that was derived from their fabled king, or line of kings, called Minos. Though one of the greatest and most distinct of the ancient civilizations, practically nothing was known of it- even its existence-until the beginning of the present century, when Sir Arthur Evans, an English archaeologist, be gan his excavations on ancient Crete and rediscovered it. For the last 60 years archaeologists have been placing the missing pieces of the Cretan puzzle together, reconstructing this lively and sophisticated civilization that flour ished in the islands of the Aegean Sea and spread throughout the Mediterranean a thousand years before Peri cles and the Golden age of Greece. The rapid and dramatic disintegra tion of the Minoan influence and civili zation, however, has continued to be an intriguing mystery. The obliteration of the Minoan empire could not pos sibly have been the result of revolution or invasion from the outside. No other people in the Mediterranean area pos sessed the resources and the naval power to defeat the Minoans and de stroy their empire. What were the causes, therefore, of the annihilation of such a great and advanced culture? If human action was not responsible for its rapid fall and destruction, the only other possibility must have been some gigantic catastrophic action of nature. Such a natural disastrous event must have destroyed the resources and the cities of the Minoans to such an extent that recovery was not, there after, possible. Evidence of such a catastrophic cent of nature exists. In the fifteenth century B.C., the volcano of Santorin an island to the north of Crete, ex ploded with unprecedented violence, sending millions of tons of volcanic ash into the atmosphere, giving rise to intense atmospheric shock waves, and generating disastrous tsunamis, or "tidal waves." Radiocarbon dating of wood and human teeth, found on the island of Santorin by Professor A. G. Galano poulos of the University of Athens in the ruins of an ancient city buried by volcanic ash, indicates that this great eruption of Santorin occurred some time around 1450 to 1480 B.C. Archaeological evidence also con firms that around 1480 B.C. some great natural disasters, including earth quakes, destroyed the Minoan palaces and brought about changes that re sulted in the rapid disintegration of Minoan civilization. The main disaster, it is now generally accepted, was the violent explosion and collapse of the volcano of Santorin, which was preceded and followed by numerous violent earthquakes. In order to illustrate this particular disaster, something should be said about the geologic setting and history of this region. The small group of islands composing the volcano of Santorin is part of an isLand chain called Cyclades, di rectly to the north of Crete. Several other volcanic islands that belong to the same group extend to the island of Methana on the coast of Peloponnesus. Another line of volcanism extends in a north-south direction, aligned with the coast of Asia Minor. From all these volcanic islands, only two, Santorin and Nisyros, have erupted in recorded times. The violent explosion of Santorin in the fifteenth century B.C. may be paralleled in many respects with the explosion of the volcano of (See "Krakatoa-The Killer Wave," Sea Frontiers, Vol 17, No 3, May June, 1971.) The latter occurred on August 26, 1883, in the Sunda Strait of Indonesia. We know very little about the explosion of Santorin, but many analogies can be drawn from the explosion of Krakatoa, which has been thoroughly studied. We know, for example, that when Krakatoa erupted in 1883, the entire northern portion of the island was blown away, reducing 10 square miles of land with an average elevation of about 700 feet to an extensive depression in the sea with a depth of more than 900 feet below sea level. The sound of that particular explosion was heard 3,000 miles away, and the sea was covered with large amounts of pumice for miles around. It has been estimated that in this eruption at least 1 cubic mile of material was blown to a height of about 17 miles and that the dust was carried several times around the earth by air currents, affecting the sun's incoming radiation and the weather for many years thereafter. Quantities of dust from Krakatoa precipitated on the decks of vessels as far as 1,600 miles away. The explosion of this volcano, furthermore, generated tsunamis of over 100 feet in height, which destroyed 295 towns and villages in Western Java and Southern Sumatra and drowned 36,380 people. 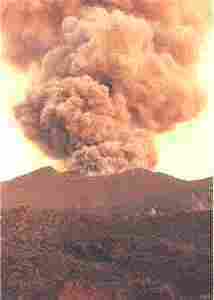 The eruption of Santorin was probably very similar to that of Krakatoa, but several times greater in strength. Volcanic explosions of this type are referred to as being "hydromagmatic" in origin. According to this mechanism of generation, cold seawater probably found its way into the lava reservoirs in the weakened base of Santorin. The irresistible pressure of expanding steam, as it mixed with the hot lava, blew off the top of the volcano. When the eruption lost its force, the unsupported remainder of the mountain collapsed into the empty cavities underneath, creating a large depression, or caldera, in the sea. This caldera, the large bay now between the islands of Santorin-has an area of 471/' square miles and an average depth of approximately 1,200 feet. Into this instantaneously formed cavity rushed approximately 15 cubic miles of seawater, filling it rapidly and creating waves that, near the center, reached many hundreds of feet in height. This large volume of water was supplied from two areas that were opened to the sea by the explosion and by the subsequent collapse of the volcanic dome. Then, just as quickly as the water had rushed into the depression, excess water rushed out like a gigantic bore. Tremendous tsunamis radiated out in all directions across the Aegean Sea and Eastern Mediterranean with speeds of up to 350 miles per hour. Atmospheric shock waves from the explosion and submarine landslides similarly generated additional tsunamis. Undoubtedly, these waves must have been tremendous in size and must have destroyed most of the coastal Minoan cities on Crete and on the surrounding Cycladic Islands. Of all the great palaces and Minoan settlements on the north and east sides of Crete, Knossos was probably the one that escaped destruction from the waves. Knossos lies further inland and is separated from the sea by a long range of hills. The palace, however, was not spared from other earthquakes that occurred at different times before or after the eruption. Archaeological work on other Aegean islands has produced quantitative approximations as to the size and effects of the tsunamis. On the island of Anafi, for example, about 15 miles east of Santorin, at the head of a valley and at an 820-foot elevation, a layer of pumice 15 feet thick was found. This pumice could only have been carried there by the slushing action of huge waves. Considerable amounts of pumice concentrated in some areas along the east coast near Kato Zakro have also been reported. On the island of Amnisos, at an archaeological site, Professor Spyridon Marinatos, a prominent Greek archaeologist, found evidence of a building near the shore that had been swept by large waves. In its foundation and in cavities within the remnants of the structure, he found large quantities of pumice stone and sand. Further up the slope on the same island, in the villa of the frescoes, additional evidence was found that was similarly attributed to the action of tsunamis. Parts of the walls and corners of the rooms of that structure have collapsed in a peculiar manner. The walls there bulge outward, and large monoliths, several tons in weight and measuring 6 feet long by 3 feet wide, have been moved out of position or are missing altogether. These effects can only be attributed to the suction of the receding water waves. Seismologists believe that in the past Crete has suffered an average of three earthquakes per century. Many of these have destroyed the Minoan palaces of the island throughout the life of this kingdom. The first major destruction of the palace of Knossos by earthquakes occurred around 1720 B.C. After the palace was rebuilt and restored to its original splendor, it was again destroyed by the earthquakes of the fourteenth century B.C. Sir Arthur Evans, in his excavations at Knossos, found evidence of such extensive earthquake destruction. Specifically, he found many Minoan houses ruined by huge blocks of rock, displaced as much as 20 feet from their original positions. Even while Evans was in Crete, twice earthquake tremors were felt, accompanied by deep rumbling sounds that were heard rising from the ground like the roars of angry bulls. According to him, there was a connection between the bulls that the Minoans worshipped and the shaking of the earth. Poseidon, the favorite god of the Minoans, was not only the god of the sea, but also the maker of earthquakes. The earth god, according to Minoan belief, kept below the surface of the ground a bull, which occasionally, when he was displeased, he unleashed to shake the earth. The excessive seismicity of this particular region can now be explained by current geophysical knowledge of its structural development. According to such theories, the whole western and southern part of Greece is intersected by two major fracture zones, along which the Eurasian continental shelf is separating from Africa, as the two continents are drifting apart. The major fracture that transverses the Eastern Mediterranean Sea along the southern coast of Crete appears to be a continuation of the Jordan rift zone, another fracture surface along which the Arabian peninsula is pushing against the large Eurasian continental block. Because of this unstable tectonic system, this whole part of the Aegean Archipelago belongs to one of the most seismically active zones of the world. The volcanoes of Santorin and Aetna and numerous other now extinct or dormant volcanoes are offsprings of this seismicity and undoubtedly have erupted with great violence countless times within their long geological lives. Recently, it has been suggested that the islands of Santorin, Crete, and other Aegean islands were the mythical lost continent of Atlantis, which has been described briefly by Plato in his dialogs. The theory furthermore is extended to say that the advanced civilization described by Plato as thriving on Atlantis, was Minoan in origin and that Santorin was one of the many and beautiful Minoan metropoles that were destroyed by the volcanic eruption and the tsunamis. Did the Sea Rise Above Atlantis? Recent archaeological work on the island of Santorin unearthed, partly submerged below the sea, a completely intact, 3,500-year-old Minoan city. Excavation work by the University of Athens uncovered one-, two-, and three-story houses and numerous Minoan artifacts and utensils. The absence of human skeletons from the city indicates that the inhabitants had advance warning of the oncoming eruption of the volcano and had time to evacuate the island. The possibility, however, that Atlantis or some of its major cities have been covered by the rising sea cannot be discounted. Of course, such a rise has been worldwide and has affected all the oceans and the inland seas. The~ effects of sea-level fluctuations have~ been even more pronounced for the. Mediterranean Sea, not only because. of its limited communication with the' Atlantic Ocean via the shallow Straits of Gibraltar, but also because~of it higher evaporation rate. Sea level has changed considerably in the last 20,000 years due to glacier and to the amount of ice held on the polar caps and on the continents. This has affected drastically the volume of water in the oceans and the seas, and sea level has fluctuated considerably. In the last 20,000 years, therefore, as we are coming out of the Wisconsian glacial period, the glaciers on the continents have recessed northward and sea level has risen by about 270 feet. From about 8000 B.C. to 3000 B.C., the sea rose rapidly to about 18 to 21 feet below the present level. Around 1600 B.C., sea level rose somewhat, then dropped during brief interglacial periods. In 700 B.C., the sea level was about 12 to 15 feet lower in the Mediterranean than it is today, and around 800 A.D., sea level had risen to within 7 t/z feet below the present level. Since then, sea level has been rising gradually due to the continuous melting of the ice caps, and the rate has been calculated to be around 1.15 millimeters per year (or about 41/z inches per century). This is a conservative estimate that can be substantiated by archaeological discoveries, submerged forests and other indirect evidence. This rise in sea level has probably submerged many of the low-lying coastal areas of the Mediterranean Sea and several of its coastal cities. Many coastal Minoan settlements in the Aegean Sea have thus been partially or entirely submerged. It is estimated that sea level in the fifteenth century B.C., the time of the eruption of Santorin, was at least 12 feet less than it is now. The ancient Minoan City discovered on the island of Santorin may have been similarly submerged by the rising sea level or, perhaps, by land slides following the eruption and the earthquakes. The good condition of the buildings of this city in Santorin, however, discounts somewhat the probability of land slides. Elsewhere in the Mediterranean, evidence of coastal submergence of several ancient cities due to rising sea level has been found. The change in sea level, however, has not been sufficient to cover large areas of land, and certainly there is nowhere an indication of a great land mass, such as Plato's Atlantis, being covered by the rising sea. In addition, any rise in sea level has been gradual and not associated with a catastrophic event of natural origin. Of course, the volcanic eruption and the tsunamis alone did not destroy entirely the Minoan civilization. Many inland cities, apparently, escaped total destruction. The natural catastrophes acted only as the catalyst for the ensuing declination. Minoan Crete for two centuries was weakened by the numerous earthquakes that destroyed its cities. These earthquakes continued well into the fourteenth century. The attempt to rebuild these cities even with more splendor than before, coupled with the expansionary empire seeking plans of the Cretan rulers, similarly had weakened the country greatly. The volcanic ash that precipitated from the eruption of the volcano of Santorin probably ruined the crops, made the land infertile, and created severe food shortages. The fact that the Minoan civilization was practically destroyed by the explosion of the Santorin volcano, the precipitating ash, and the tsunamis has also been verified by other evidence. It has been found, for example, that around 1400 B.C. a large migration of Minoans took place to the eastern part of the island of Crete. This is an area that was spared from volcanic fallout due to prevailing winds, and it was an area where crops could be cultivated. Similar migrations of Cretans and other islanders to the mainland of Greece and to Peloponnesus also took place at about the same time. These refugees introduced to the mainland Greeks many of their skills, arts, and other wonders of Minoan civilization. The Myceneans of Peloponnesus, by that time, had become a power to be reckoned with in ancient Greece. Capitalizing on the weakness of Crete, the Mycenean dynasty took control of Knossos and eventually of most of the island of Crete. Around 1400 B.C., therefore, a new Mycenean civilization began to flourish in Greece, incorporating most of the advances of the Minoan civilization. With the Myceneans, an alphabet was introduced and the recorded history of Greece begun. The Minoan civilization, practically destroyed by the explosion of Santorin, the tsunamis, and the earthquakes, finally dwindled, collapsed, and lost its unique identity. Pararas-Carayannis, George. The Waves That Destroyed the Minoan Empire. Sea Frontiers, Vol 19, No. 2, p. 94, March-April, 1973.
now available from Amazon, Barnes and Noble and other major bookstores. It can be also ordered by contacting directly Aston Forbes Press.